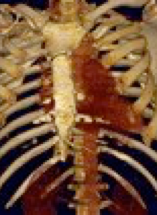 •How I do it - photos, videos and text descriptions of common thoracic operations. General Thoracic Surgery is the surgical treatment of diseases of the chest, excluding cardiac surgery. The specialty includes: chest trauma, surgery of the lungs, oesophagus (gullet), chest wall and ribs, the diaphragm and other intrathoracic structures. This site has been designed as a resource for our own Thoracic Surgery trainees. We hope it is also useful to surgeons throughout the world who may be interested in the way we practice Thoracic Surgery here in Belfast.